Two years ago, I woke up and there it was: the Ali on the Run Show in all its hot pink glory on iTunes. My passion project was live and ready for listening! I launched having no idea what I was doing. I refuse to go back and listen to those earliest episodes because I know they were probably pretty rough. As I hit submit on my five debut episodes — a solo intro episode, plus conversations with Emily Halnon, my husband, Alison Desir, and John Honerkamp — I got dressed and went for a run in Central Park. I loved this day! February 11 is very special to me. I ran with a group of friends and felt great. All the while, my phone was blowing up. People were listening! And they liked it! I felt ecstatic, validated, and so motivated. I couldn’t wait to keep going. For me, the best part of the show has always been the authenticity of the conversations. I pride myself on my integrity and staying true to myself. Yes, I want to give listeners what they want. But I stand by my stance that the Ali on the Run Show is an inherently selfish endeavor — in a good way. I get to have conversations every week with men and women I find inspiring. I get to fuel my curiosity, to ask the prying questions I’m dying for answers to, and to better my own life by hearing more about the decisions other people have made in theirs. It is so fulfilling and so rewarding. Is this my favorite picture ever? PROBABLY, OK.
And then there’s the community surrounding the show. I can’t adequately express how much pride I feel when guests come on the show and, after their episode goes live, reach out to say things like, “Your community is amazing!” I remember both Meaghan Murphy and Emily Abbate — two recent guests — both hitting me up just to say how great all of you are. And I mean, duh. I know that already. How lucky am I to have thousands of virtual friends, and to get to talk to them — to you — every week? In two years, I’ve put out 118 episodes. I’ve done two lives shows (both while pregnant), and am hosting my third tonight. (If you’re in the NYC area, I so hope to see you there! Annie is coming! And it’s free!) I’ve talked to powerful, impressive people, and I’ve learned so much. 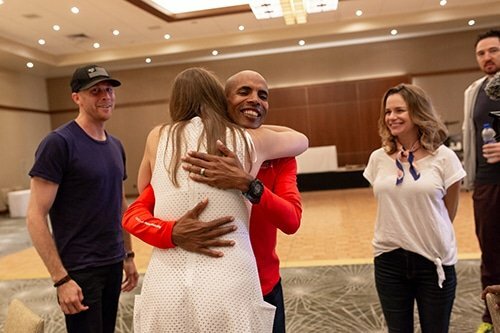 I’ve shared the stage with Meb Keflezighi, Andrea Barber, Chris Heuisler, and Des Linden, all at the same time. 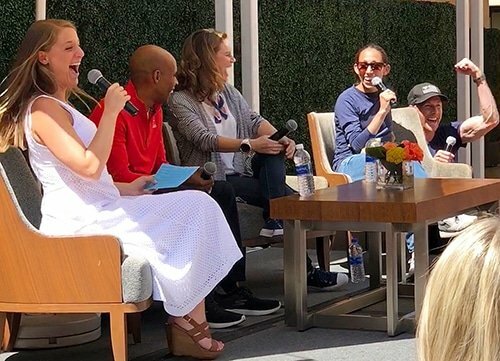 Then, the day of my baby shower, I got to take a different stage alongside Emma Coburn and Jenny Simpson. Actual dream come true right here. Oh and I’ve made plenty of mistakes along the way! I recorded one of my all-time favorite episodes to date with my audio on the wrong setting. I forgot to hit record once. And I’ve had to tell multiple guests that “Skype is being weird and I need to restart real quick,” when really I needed to run for the bathroom. I’ve transitioned from recording episodes in my bedroom closet to recording in an actual studio (though I can’t take much credit for that; it’s at Brian’s office and I’m a freeloader). I’m proud of what this show has become, and I’m grateful to everyone who listens for making it a success in this crowded, crazy, ever-growing podcasting bubble. In the studio with Kayla Itsines. Ugh I love her. Episode 6 with Chris Heuisler: Because he’s one of the greatest people I’ve ever known. Episode 13 with Chris Mosier: Because what he has to say — and teach — is really important. Episode 31 with Dan Nevins: Because he might be the most inspiring dude I know. Warning: You’ll cry. Episode 45 with Andrea Barber: Because she’s a gem in Hollywood, and she’s having the mental health conversations that make our society better. 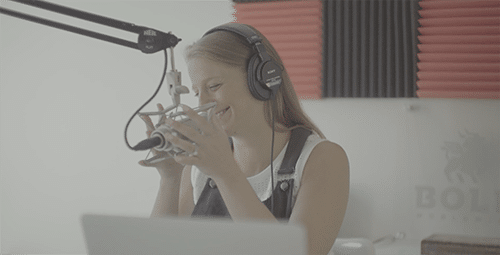 Episode 70 with Katie Burke: Because she’s practically perfect in every way. 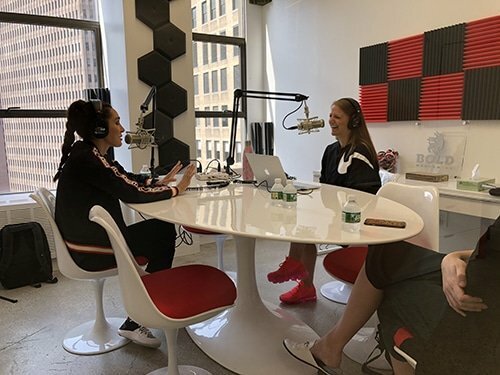 Episode 79 with Kayla Itsines: Because it’s Kayla Freaking Itsines. Episode 94 with Ellen Latham: Because she’s the brilliant brains behind the Orangetheory behemoth. Episode 101 with Jeannie Klisiewicz: Because everyone loves Jeannie, AKA Ellen’s receptionist. Episode 113 with Meaghan Murphy: Because her energy is infectious, her insights are on point, and her career has been an impressive result of hard work and talent. Babies abound! Alison Desir, Kayla Itsines, Brynn Fessette O’Neill, and Sarah Clancy are all pregnant, while Michele Gonzalez, Lindsey Hein, and Neely Spence Gracey all had babies since we last recorded. Job news! Megha Doshi relocated from San Francisco to New York City, and traded one badass brand — Strava — for another: Peloton. Meredith Kennedy also traded one badass brand — BuzzFeed — for another: Facebook. Bianna Golodryga was promoted to co-host of CBS This Morning, and Mary Wittenberg is taking over the cycling industry. 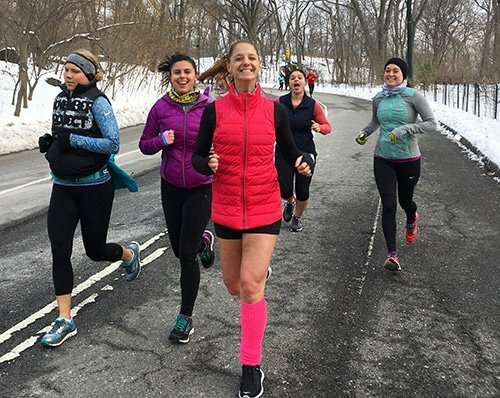 As for the pros: Kara Goucher made her return to the marathon circuit in Houston, Allie Kieffer is everywhere, Gwen Jorgensen went all-in on the marathon, Molly Huddle finished fourth at the New York City Marathon and keeps getting better, Des Linden will defend her title in Boston in April, and Gabe Grunewald continues showing cancer who’s boss. What’s next for the Ali on the Run Show? Loaded question! A new website. Merchandise and gear, finally. More live shows. And more shows, period. I have a few special series in the works: Q&A Week is coming very soon, and I’m working on a “new motherhood” series. I have big ideas and limited time for execution, so I’m dreaming of everything and committing to nothing! Big dreams. Zero commitment. WOW INSPIRING. One last time for now: If you are enjoying listening to the Ali on the Run Show every week, THANK YOU. I would be so grateful if you’d head to iTunes and leave a rating and written review for the show. It’s quick and easy, especially if you’re on a desktop computer. Wouldn’t it be cool to hit 1,000 reviews?! I think it would. Thank you for your kindness, your feedback, your downloads, and your support. 6 Responses to "2 Years of the Ali on the Run Show"
Thank you for two years of great episodes! Can Megha hook you up with a Peloton instructor for an interview?? That would be awesome. You have done amazing things with your podcast. Congrats!! Thanks for putting it together – I have been loving your guests. Keep it coming! SO many congrats on two years!! I’ve been listening since day one and always prioritize the show when it’s released! So happy and inspired on how much you’ve grown your business over the past 2 years! I haven’t read another blog or listened to another podcast that I’ve loved as much as yours. Hoping to make it to a live show one day!